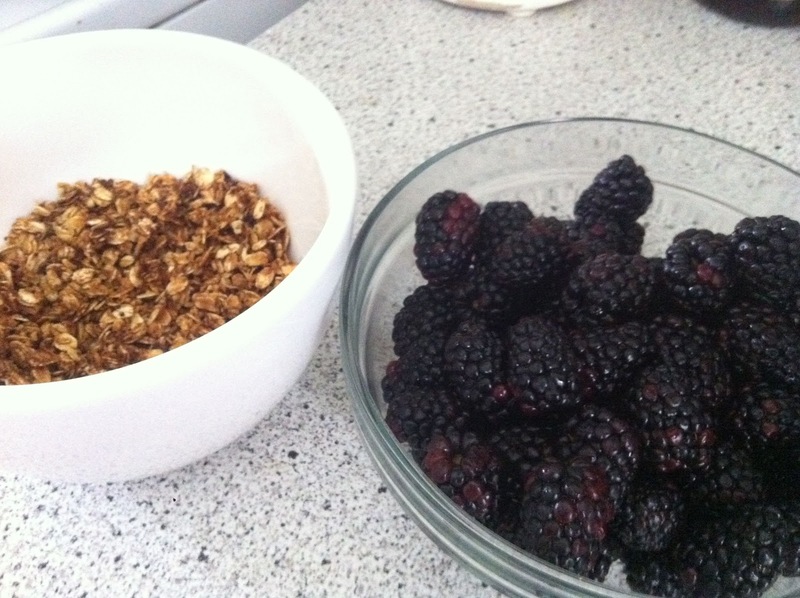 -Recitherapy: homemade granola . . . for parfait ! 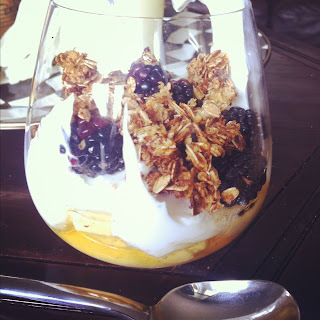 Yet again, we've been away from the comfort of our very own kitchen for the last week, actually a little longer for James... so this morning when I woke up, I decided I needed to make a quick batch of homemade granola so we could have a fancy little greek yogurt parfait right here in the comfort of our own kitchen. 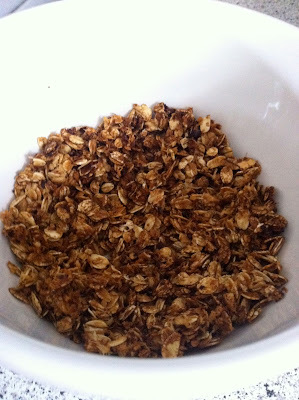 Pour the rolled oats into a bowl... remember that when you make granola, nothing's better than those gorgeous golden clumps that you get, so don't be shy with the oats... they'll clump together. 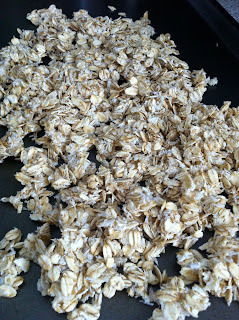 Add in a few teaspoons of wheat germ and a tablespoon or two of flaxseed. Lightly dust the mixture with sea salt, then add in a few dashes of regular table salt. Generously "snow" the mixture with the coconut... I should've used more, it's so delicious. Now mix it all together well. 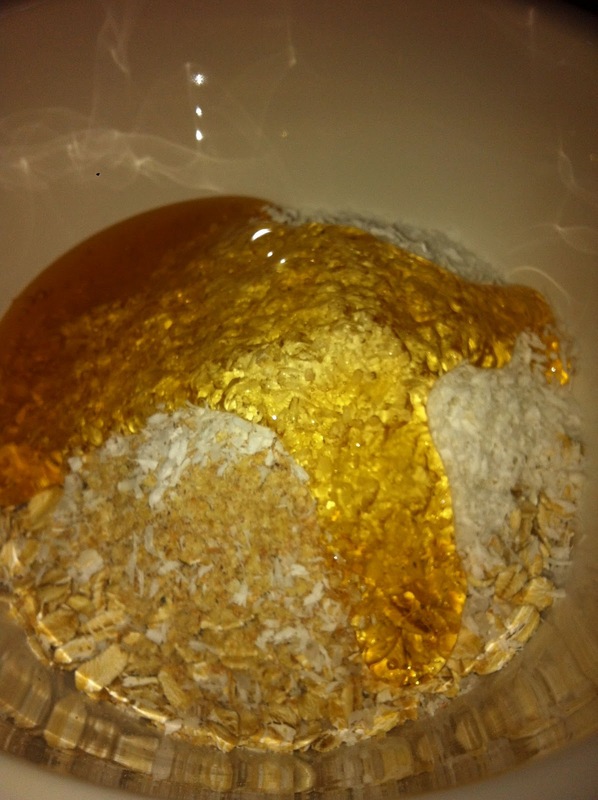 Pour in a fairly lavish amount of honey, seeing as this is your only real sweetener for the granola, and stir it all around using two spoons. Make sure to really mix it well. Now spread the mixture onto an ungreased cookie sheet and spread it in a thin layer so that all the separate little oats can turn golden. Pop it in the oven for 8 minutes, then shuffle the oats around with a spatula to let them brown on the other side. Put it back in the oven for 8 minutes and continue the shuffling around process until the granola is golden and crispy. If you end up putting it back in after 2 full 8 minute turns, just be sure to periodically check that it' not burning... it's very easy to burn oats in that hot of an oven. Now take the pan out and let it cool for about 5 minutes. Then scrape the granola off the pan. This will leave you with perfectly crunchy oats and lots of clumpy pieces... exactly what's needed for a homemade yogurt parfait. Let them cool a few minutes longer, scoop, and there you have it! 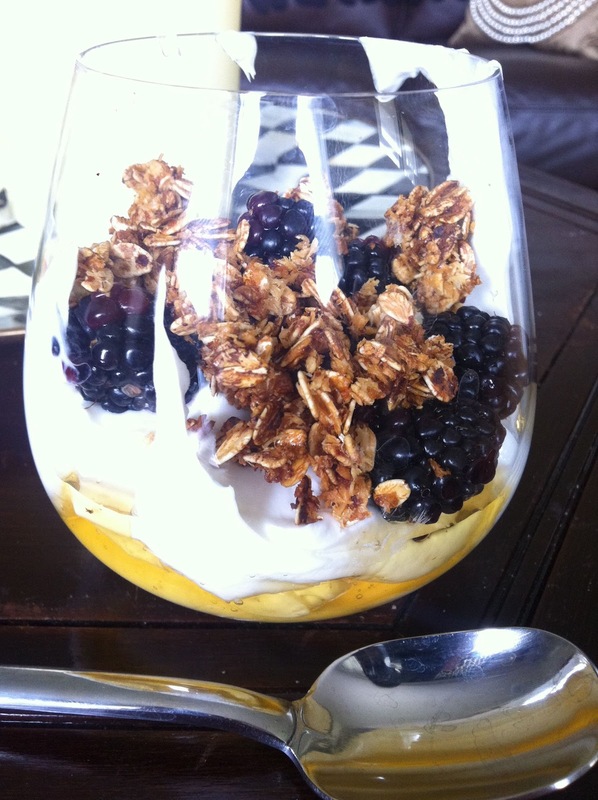 A honey pool on the bottom, a giant dollop of creamy greek yogurt, a handful of beautiful berries and your new fabulous granola on top..... heaven in a glass. What better way to start your day?